I've been at this for two weeks actually, but we'll just call this week 1 since the first week was some overviews of the workouts and getting into it even though I did full workouts those days. I could barely get up and down the stairs all last weekend after doing what felt like 800 lunges. Hurt so good. It was a reminder of why you should never NOT be doing some sort of gym/strength training program because it always hurts getting back into it. First of all, the program is two, 4-week, training blocks with 4 days of workouts each week. Two upper body workouts and two lower body workouts with a break on Wednesdays. All exercises each day are designed to focus on the cycling specific muscles in an effort to train them to be more powerful on the bike. Day one may focus on strengthening your upper body to reduce fatigue when holding yourself up on the bike. Day two may be focused on leg power for performance and the other lower day is designed to focus on lower body muscle groups that assist in the hinging and mechanics of the muscles during pedaling. In addition the actual training program, we did a personal assessment that documented body measurements including body mass, heart rates standards, and what your personal goals are. For me, I primarily want to loose 30 pounds by summer while getting in much stronger physical shape before my first event in March. 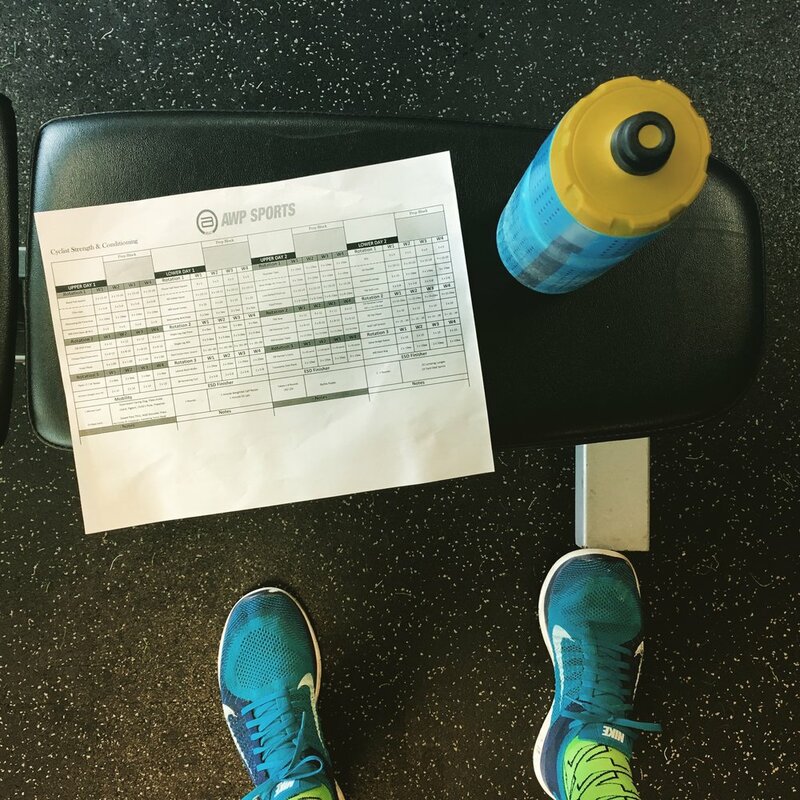 The performance goals for me are secondary to the weight and overall physical shape goals. Let's be honest, spandex is never flattering, but even less on an overweight dude. Not that it really matters what folks things as long as you're having fun, but it does matter to us as individuals. What are those performance goals exactly, not 100% sure, but like any physical training plan, I'll notice improvements if I'm disciplined. Once I get a few months of this plan under my belt, I can begin setting some more goals related to performance. I'll be meeting with a nutritionist in the next week or so as well as part of the program. I'm excited about this because even though I've lost 30lbs in the past, the normal prescribed "diet" hasn't always worked. So, I have a lot of questions about alternative focuses like lower carb, ketogenic, or even more things like paleo that have worked in the past. I started doing CrossFit four years ago and started paleo at the same time. Both of those things were very successful in helping me lose 30lbs. I still love CrossFit and our friends at Mad Apple, but my schedule just didn't allow me to make it to 4 or more classes a week that I felt like I needed to in order to justify the cost. If you're thinking about CrossFit, then I'd highly recommend that as well. Overall, it's different than I initially pictured it in my mind. I went in hoping that many of the workouts prescribed would be body weight oriented and could be done anywhere. I was thinking it would be more focused on on-the-bike exercises with some core/body weight workouts to go along with. It is 100% at least in this first 4-week training block all weight room oriented work. The cycling part is on my own to do on off days or when I can fit it in, and under my own planning. We're talking through some potential on-the-bike plans to marry with the program. Even though it wasn't what I was initially expecting, the training plan is great and I'm 100% committed to it. Like anything new, you don't fully know until you get started. I like to work out and don't mind the process of working hard to accomplish goals, but I'm not naturally motivated to just show up to the gym and create my own workouts. This plan is focused, attainable, and easily done in 45 minutes, which is great. So, I'm committing this training plan and my weight loss efforts ahead of on-the-bike work this winter to see what happens if those priorities are shifted. I'm still on the bike as much as I can, but if I can't get on it but made it to the gym, I'm not going to fret. Spring will be here soon enough. So far, I've been able to workout each day with Dillon being around, which has been nice to ask questions about the workouts and what results should look like. 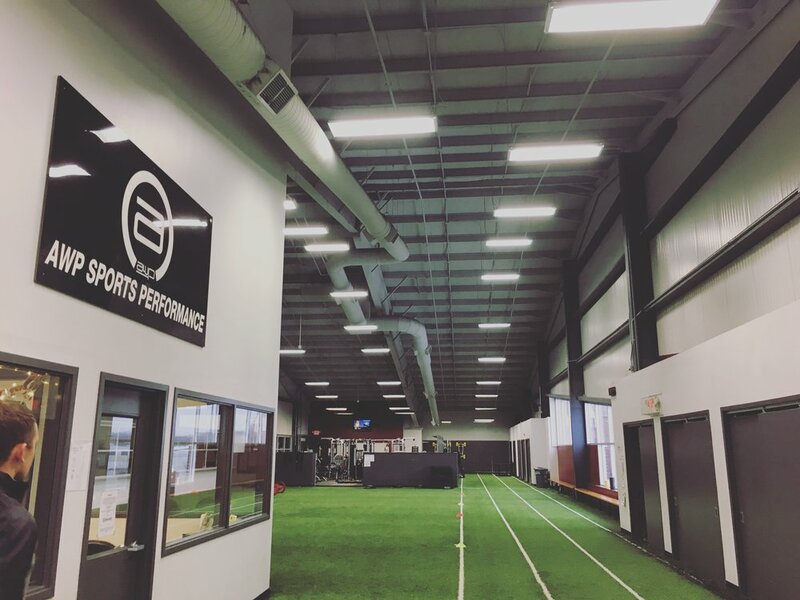 I've worked out at both the SportOne facility on Lima Rd and The Summit location on the former Taylor University campus. Both of them are top notch and have everything you need to succeed and are included in the program. I started the year with a 7-day spiritual/physical renewal fast, which I've been doing for the past couple of years. I personally like to commit a few days to asking what the Lord may have for me, my family, my work at NL, and whatever else I need to hear at the beginning of the year. It's kind like a reset button for my mind, spiritual life, and definitely physical life as well. Helps breakout of those bad eating habits and enter new ones with a clean slate. I'm really mentally motivated right now and am excited to get that first month of commitment made so it becomes easier as I see results. So far, the workouts have been great and I want to invite you to join me in this process. The more local friends get involved, the easier it will be for us to all commit to the goals we set. Plus, it's always more fun to workout with others. Plus, if you're not already committed to a gym membership, this is well worth the $75/mo cost when you factor all the different aspects of the program.